An application to add a virtual webcam with 1000+ cool webcam effects. 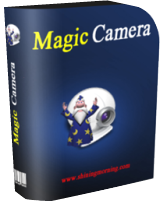 Magic Camera 8.8.7 was available as a giveaway on February 18, 2016! 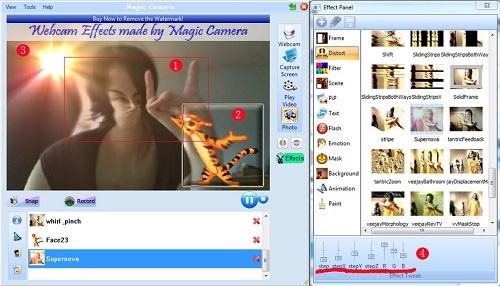 Magic Camera is a must-have webcam enhancing program for webcam chat and webcam effects. It works for all Cameras including (HD) Webcams, Digital Cameras, TV/Video Capture Cards, Camcorders, IP Cam (via Directshow). Recording webcam videos and taking pictures with webcam effects are also supported. Win a Full-functioning Lifetime license of MagicCamera for the most useful suggestion! Use the Idea Informer Widget to submit your idea. How would you improve Magic Camera 8.8.7? This software lets you capture audios from online streaming audio/radio/webinar sites. For example, you can use your browser to open an online movies, songs, radios, webinar site and click the recording button in Streaming Audio Recorder Plus. Then all sounds you hear are recorded in smart separated MP3 files. You still can use your computer and hear sounds while recording. All in one video converter. You can add as many videos as you like in Greeen Free Video Converter, then launching the batch convering to save time and effort. Just select the video files to be converted, select presets or adjust the settings, and click Convert! It’s that easy. 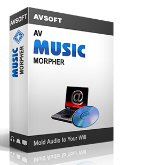 Virtual Audio Streaming adds a virtual sound card on your system and becomes an enhancement/wrapper of your real sound card. You can use it as an 'what you hear' sound recorder and in sound broadcasting as a virtual microphone. Virtual Audio Streaming also fixes the 'no stereo mix' sound card issue on Windows 7/8. Been using MagicCamera on my laptop ever since the proprietary HP webcam software crashed and MagicCamera appeared on GOTD. So nice when something actually works. The fx work in combination, they're very tweakable, and you can save them out. --Downloaded, unzipped to folder, double-clicked Setup.exe. Temporarily turned off virus protection; same thing. --During installation, it tried to configure Roxio CinePlayer (I have Roxio 2011 Creator Pro), then failed because I didn't have (or it couldn't find) the Roxio installation disk; cancelled Roxio stuff. --Each time I run it, brings up UAC screen (trying to write into Program Files (x86), tries to configure Roxio CinePlayer again, and brings up the WebCam configuration screen again. --Got it working and configured to my Logitech camera. While playing with it, somehow invoked "Capture Window and couldn't get out of that. Finally figured out that clicking on "WebCam" again takes it out of "Screen Capture" mode. --Seems to work ok, sort of. So far, some of the Scenes have black backgrounds instead of the promised scene, and it seems to freeze often; have to exit Magic Camera and re-open it. Looks interesting--thanks GAOTD. I'll keep playing with it, I think. Win7 64-bit --Downloaded, unzipped to folder, double-clicked Setup.exe. --Got UAC screen: clicked Yes --Got little GAOTD screen; clicked Close --Got little GAOTD "Successfully activated"; Closed --Got "Magic Camera 8.8.7 activated — what next?" page --but no installation process or installation Temporarily turned off virus protection; same thing. Third time lucky; installed and activated --During installation, it tried to configure Roxio CinePlayer (I have Roxio 2011 Creator Pro), then failed because I didn't have (or it couldn't find) the Roxio installation disk; cancelled Roxio stuff. --Each time I run it, brings up UAC screen (trying to write into Program Files (x86), tries to configure Roxio CinePlayer again, and brings up the WebCam configuration screen again. --Got it working and configured to my Logitech camera. While playing with it, somehow invoked "Capture Window and couldn't get out of that. Finally figured out that clicking on "WebCam" again takes it out of "Screen Capture" mode. --Seems to work ok, sort of. So far, some of the Scenes have black backgrounds instead of the promised scene, and it seems to freeze often; have to exit Magic Camera and re-open it. Looks interesting--thanks GAOTD. I'll keep playing with it, I think. So disappointed that many have had problems with this program; the grandchildren have loved the crazy videos that are possible to make while using it. My tests in XP and Windows 7 have had no problems and so if you can get it to work please do, kids love playing with it. Have managed to create videos very quickly and easily that to do in a full video editor would be extremely difficult and time-consuming. It is not meant to produce professional standard videos but ones are more than acceptable for most people. installed ok win 8.1 shut program off, had process monitor in background & realized that program never shut off !!! what up. is it dangerous?? Installation: fast without any problem. 40MB. Program makes thrue what it promises. Worked well with Skype. I' ve seen no bugs, any unnecesary popup or warning on my Win7 Prof. Installation: fast without any problem. 40MB. Program makes thrue what it promises. Worked well with Skype. I' ve seen no bugs, any unnecesary popup or warning on my Win7 Prof.
Don't bother with this one. I have WIN 7 64bit. It would work, then it did not, then work again. VERY buggy! When it did work it would not record, only take snaps. Yes, I followed the instructions to download the "Proper codec", and I received 3 extra programs. Including something from Lavasoft that took over my home page and provided me with the added bonus of popups! This could be a real nice program, if it worked and I didn't get extras. Just wasted the past hour removing it and the "bonus programs". I will be running malwarebytes, so see if there are anymore extras. Don't have a bad morning with this one! Don't bother with this one. I have WIN 7 64bit. It would work, then it did not, then work again. VERY buggy! When it did work it would not record, only take snaps. Yes, I followed the instructions to download the "Proper codec", and I received 3 extra programs. Including something from Lavasoft that took over my home page and provided me with the added bonus of popups! This could be a real nice program, if it worked and I didn't get extras. Just wasted the past hour removing it and the "bonus programs". I will be running malwarebytes, so see if there are anymore extras. Don't have a bad morning with this one! Sophos nor Malwarebytes nor PanderCloud have ever reported any problems with this software on my machine. <b>Crazy Denny</b> Sophos nor Malwarebytes nor PanderCloud have ever reported any problems with this software on my machine. here we probably experience one of the classic problems of an application not specifically adapted to Win10 drivers, and with yet another false representation of asking price by GOTD hardly worth trying out. My Cyberlink webcam software also offers some gimmicks but (infantile) gimmicks and professional results somehow don't belong together. my thoughts here we probably experience one of the classic problems of an application not specifically adapted to Win10 drivers, and with yet another false representation of asking price by GOTD hardly worth trying out. My Cyberlink webcam software also offers some gimmicks but (infantile) gimmicks and professional results somehow don't belong together. If it helps at all in light of problems others are reporting, this is older video tech using VFW [Video For Windows] with a kernel mode virtual webcam driver, mcdevice.sys -- you can set the app not to use it through the Tools menu -> Manage Virtual Webcam Device, though I don't know how much that'll help, as mileage may vary. Webcam compatibility will also vary, again because it's older tech -- I'd guess cheaper webcams using more generic drivers might be more compatible. That said, after monitoring installation in my XP Mode VM [it seems right at home in XP BTW], I didn't see anything truly horrible happen, though because of the driver it wouldn't be a bad idea to backup or at least set a Restore Point. It removed several video related drivers & files, replacing them with the identical drivers & files -- the only thing added by the app was that driver I mentioned, mcdevice.sys, though the process added 1343 new registry entries [that number would likely be higher in 7-10, assuming you got it to install]. As a as a matter of interest it works well with a reasonably modern web camera, namely Logitech C270 HD Webcam without any difficulties in XP. <b>mike</b> As a as a matter of interest it works well with a reasonably modern web camera, namely Logitech C270 HD Webcam without any difficulties in XP. I downloaded, installed and registered the last offered version from the site which is "8.8.4 New", however after installation it is version is 8.8.5. On the other side the free version offered is 8.8.7. Anyway, the program is not intuitive, it is buggy and pops up lots of warnings. Uninstalled. W10, 64-bit. The installation process was buggy - the first time, it locked my machine up and I had to restart. The second time, it seemed to go OK, and asked me to restart the program. When I did so, the program said that there were some errors, and that I would have to re-register. By this time, I was sick of it, and uninstalled. Have used this program for a number of years and it is one of my favourites, the grandchildren love the weird and strange videos I have created using it. It sat on my computer for quite a long time without being used; the interface has a somewhat childish look about it, don't be deceived! On opening on the top right it says WebCam when you select this or window to the right contains a drop-down list of option, my WebCam comes under USB video device. The WebCam image that appears can now have effects added to it, this is why it is called magic. Combinations of effects can be created and a video recording or snapshots can be made. I sent a video I had made to an acquaintance who does a lot of video work and he thought I had bought a high end video editor because of the effects. A very clever piece of programming in which you can add your own effects, for instance you can add your own background to the image being viewed, also you can modify effects, in fact just too many clever little features to be able to mention them all. Have used this program for a number of years and it is one of my favourites, the grandchildren love the weird and strange videos I have created using it. It sat on my computer for quite a long time without being used; the interface has a somewhat childish look about it, don't be deceived! On opening on the top right it says WebCam when you select this or window to the right contains a drop-down list of option, my WebCam comes under USB video device. The WebCam image that appears can now have effects added to it, this is why it is called magic. Combinations of effects can be created and a video recording or snapshots can be made. I sent a video I had made to an acquaintance who does a lot of video work and he thought I had bought a high end video editor because of the effects. A very clever piece of programming in which you can add your own effects, for instance you can add your own background to the image being viewed, also you can modify effects, in fact just too many clever little features to be able to mention them all. Just get it! Magic Camera 8.8.7 did not work on my comp. Did not find the webcam. Magic Camera is now uninstalled.